As an agency owner of 20+ years, and someone who works with/guides small to mid-sized agencies every year – we spend time with hundreds of owners, leadership teams, and their staff. We listen to their frustrations, excuses, and stories. They nod in agreement, but most of them will let “we’re too busy” or the old stand by – “cobbler’s children have no shoes” excuse away their choice. We hope you’re among the 5 percent who decide to take action and refuse to go on along with the status quo. 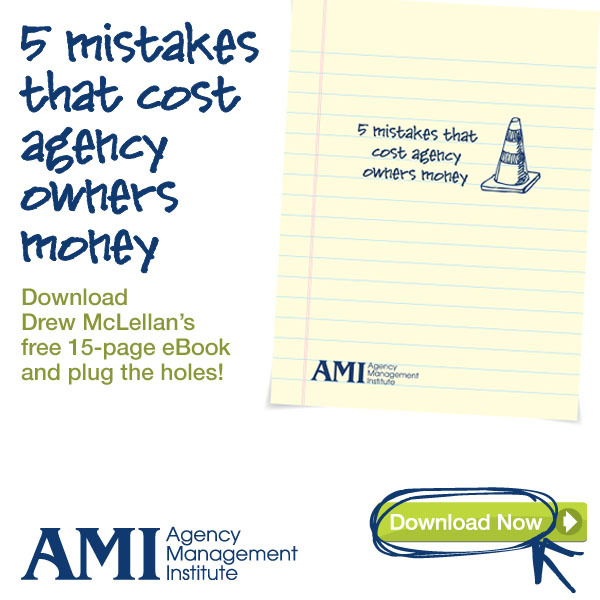 We can help you build a stronger agency. Build a more secure future. And make more money. nAttend our Best Management Practices for Agency Owners workshop. This is where owners of small and medium-sized marketing communication agencies come to learn and discuss their most important challenges. Consists of two full days with your peers within a facilitated discussion about how to operate your agency for maximum profit using the right structure, operating systems, and staffing to make it all possible. You will walk away with fresh ideas. You will feel excited about the possibilities and re-charged to take on the day-to-day challenges of running an agency. Principals only. No employees unless they are accompanied by the owner. No exceptions. Attendance is limited and no more than 2-3 principals from any one agency. We do this to keep the communication open and give everyone a chance to discuss agenda topics and to get to know one another. Attendees are comprised of non-competing participants from all parts of the marketing communications industry—B2C and B2B ad agencies, graphic design, media, interactive and public relations firms. This workshop can be especially valuable for agency principals who came up through the agency ranks and who would benefit from additional knowledge about how to build and operate a profitable agency. Many of our attendees come from secondary markets. Eighty percent of them have fewer than 50 employees. Many have as few as a handful of employees with a blend of contract labor and freelance support. No matter where you live or how small your agency is — this is the workshop for you. Tuition: $1,895 for the first attendee. $1,695 for each additional attendee. AMI members get a $300 discount on each seat. Tuition price per person includes all meeting materials and breakfast/lunch both days. We’d also like to invite you to join us for dinner the first evening as our guest. Travel, accommodations are not included.